Red Bull New York announced today that it has signed midfielder Gordon Kljestan to a developmental contract. To make room for Kljestan, the Red Bulls waived midfielder Kevin Mesa. "Gordon has impressed us since joining our team on trial a few weeks ago," said Sporting Director Jeff Agoos. "We think that he can make a contribution to our squad and we're excited to have him on board." Kljestan came into the League after being drafted by the Los Angeles Galaxy in the first round, 10th overall in the 2007 MLS Supplemental Draft out of Seton Hall University. The Huntington Beach, CA, native featured and started in six games for the Galaxy reserve team and logged 513 minutes. Kljestan was a 2006 All-Big East preseason selection and 2005 All-Big East honorable mention midfielder. Prior to signing with New York, Kljestan had started in two MLS Reserve League matches for the Red Bulls. 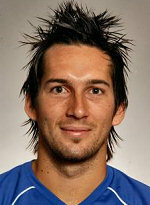 Gordon, 24, is the brother of Chivas USA midfielder Sacha Kljestan. Mesa signed with the Red Bulls on March 20, 2008 after training with the team in preseason. The Queens product played 251 minutes over four games for the Red Bulls reserve team this season. He had not appeared in a first team match.